So when we heard about this French bistro in Makati, we decided to try it. Being a bistro, it was a small, modest restaurant with moderately priced food -- perfect for people like us who wanted to try French food but were a little intimidated. According to some blogs, the chef was very accommodating, which was a bonus. We ordered the set dinner meal, which consisted of your choice of appetizer, main course, and dessert. I ordered terrine, lasagna, and apple pie while bf ordered cucumber soup, ox tongue with ravigote sauce, and chocolate mousse. It was my first time to try terrine. I chose it because it was similar to pâté, which I like. The terrine was a lot bigger than I expected but I had no trouble finishing it because it wasn't too filling or cloying. The lasagna was good, the topmost layer was crustier than the typical lasagna. The cucumber soup was filling and the ox tongue was tender, with the ravigote sauce complementing the tongue's mild flavor. The apple pie was different from my expectation. I was expecting either a pocket pie with a jam-like filling or a thick pie with chunky and still-crunchy apple filling. 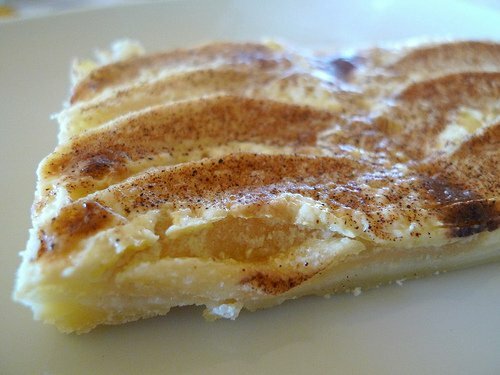 Le Bistro's apple pie was thin and light. My set meal cost P580; bf's was P740. Still pricey for us, but for a French dining place, I guess it was reasonable. 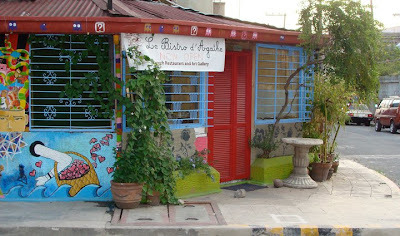 As you can see from the picture, Le Bistro's exterior was very colorful and artsy-fartsy. Inside were lots of paintings so as your tongue feasts on the food, your eyes feast on these colorful artwork. I saw pictures from other blogs and from Le Bistro's Facebook page and those pictures showed different paintings so I guess the paintings are changed regularly, which gives patrons a reason to come back aside from the food. 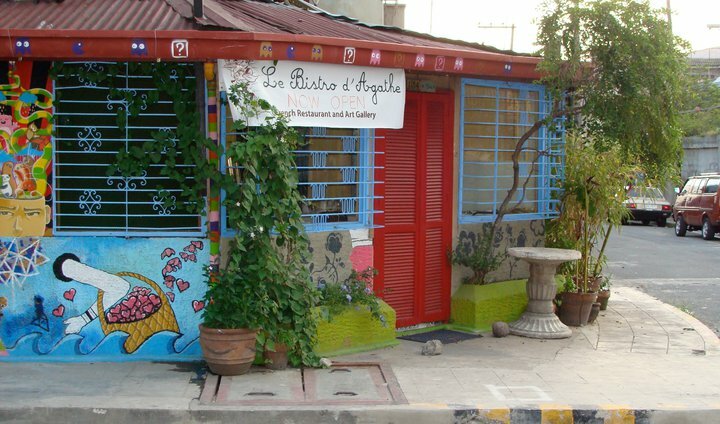 The bistro was located in a quiet part of Makati, more of a residential type of area rather than the usual foodie strips. The lighting inside then was soft and warm, accentuated by the candle at the table. The server was attentive. The food arrived quickly and in order one after the other. After appetizer, the used dishes would be removed at once and the main course served. After you finish the main course, the used dishes would again be removed quickly and the dessert would be served. French Chef Patrice Delobbe was also accommodating. After we were handed our menu, he came to our table and explained the dishes one by one. After we were finished, he also asked us if we enjoyed our food. I also saw him signaling to his staff when he saw we were finished with a course and the staff was not nearby. I just made my own cucumber soup yesterday. But how come yours was filling? What's in the recipe? Aside from the hard-to-pronounce menus, food in french restaurants are known to be elegantly prepared and served not to mention the classy ambiance that's why most people are being intimidated. Looks like Le Bistro is different. I should ask my husband to treat me there. Bon appetit! I've already tasted or eaten lasagna and the rest are in my wish list... hehehe! It seems the place is cozy and best for a group or company get-together eating spree. But the foods are exorbitant! Very nice interiors. I've never visited a place like that. I am getting thrilled with all those pieces of paintings. You did a great review of Le Bistro, as you've successfully painted a French restaurant that breaks its usual 'impression'. :) I would just have to say that I'm a little bit iffy with attendants clearing my plates as soon as I'm done with a dish. Hehe. i like the way you write about this resto - coz eventhough i am not really a fan of french cuisine (bec i have allergy with beef and prefer spicy food), i was engaged in the reading! i am curious about the cucumber soup though.I guess i can handle that! Food, arts plus accommodating staff would make a worth dining in! 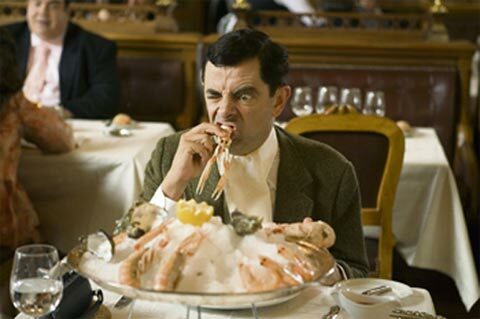 Honestly, I've never tried to eat in a French restaurant. Hope I can find time to visit this place. it is good eat at french resto once in a while the price must be high but the experience and joy of eating is priceless.I like the interior although the outside is not that inviting. I like their interiors. It shows a lot of photographic opportunities for me ahead when we try there soon. Do you recall if they have high-chair for infants? Hmm I don't remember seeing any high-chair during our visit. Best to ask them directly though, maybe they have some in their storage area. You said good in terms of taste and not much else....hahaha. is just OK for me. Oh no! Looking at the photo, I immediately recognized this was the place where Fat Michael's used to be in. Same owners pa din ba? Does that mean no more of Fat Michael's delicious steaks? Yup Fat Michael's used to occupy the place. I don't think they have the same owners.